It always makes me happy when I actually PREFER the cheaper option. I didn't see this jacket on Forever 21's website. I couldn't find it anywhere. Sorry about that, it seems to have sold out after I created the post. i'm a sucker for military jackets! it was such a good pick that it's now sold thru! I found a great option from Bloomie's for a decent price. http://www.shopstyle.com/action/loadRetailerProductPage?id=117039440&sc=1. what do you think? 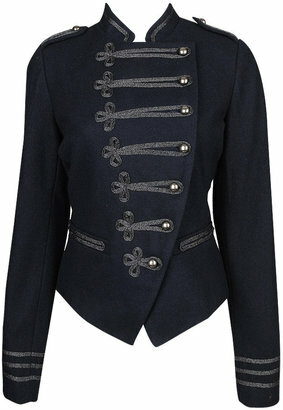 Not a fan...It looks like your in a marching band.